When was the last time you saw something remarkable? I know, I couldn't remember either. When Amy Green's young son Joel was diagnosed with a rare brain tumor, she made up a bedtime story for his siblings to teach them about cancer. What resulted was a video game, mostly created by her husband Ryan, "That Dragon, Cancer," which takes players on a journey they can't win. That's right, someone used the video game, a medium we think we know, to accomplish something seemingly impossible. To understand how this happened, you could watch Amy's TED Talk. Or read Wired Magazine's thought provoking exploration "A Father, a Dying Son, and the Quest to Make the Most Profound Videogame Ever," written by Jason Tanz. Tanz explains: "That Dragon, Cancer is not a tricky game to master. Indeed, it’s barely a game at all, more a collection of scenarios that the player explores and clicks through. There is some degree of agency—you can decide how long to spend in any particular scene, for instance — but the overwhelming sensation is one of being a bug caught in a rushing river; you might veer a few degrees in either direction, but you can’t alter the overall flow." "The questions That Dragon, Cancer is asking... are the kind of spiritual and existential quandaries that have haunted humanity since Job: Why are we here? Can we influence our fate? What kind of God would allow such suffering? How do we endure the knowledge that we, along with everyone we have ever met and loved, will die? 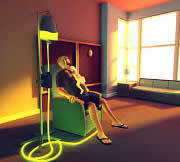 ...That Dragon, Cancer doesn’t provide any solutions to its queries." Tanz quotes Reality Is Broken, by designer and academic Jane McGonigal, in which she argues that we should engineer our world to be more like a videogame, incorporating its system of rewards and escalating challenges to help us find meaning and accomplishment in our lives. "Green, though, is doing the opposite. He’s trying to create a game in which meaning is ambiguous and accomplishments are fleeting. He is making a game that is as broken—as confounding, unresolved, and tragically beautiful—as the world itself." Or you could do none of the above, and play the game.